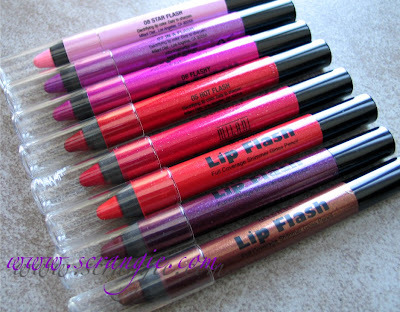 One of the newer items on the Milani display are these awesome little gems called Lip Flash. Well, I'm assuming they're seen on the Milani display because I've never actually seen them locally as every Milani display in my area is chronically empty... But nevertheless, these things are completely awesome. They're like a cross between a lip pencil, a lipstick and a gloss and they come in eight gorgeous shades. From the bottom up: Lip Flash, News Flash, Flash Light, Photo Flash, Hot Flash, Flashy, In A Flash, Star Flash. 01 Lip Flash. 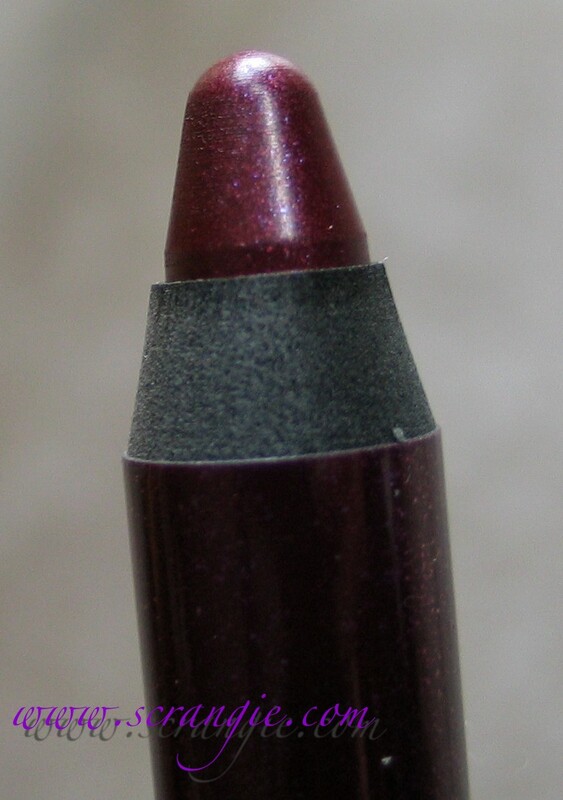 Bronze-plum metallic with gold duochrome. 02 News Flash. Raisin with duochrome shimmer. 03 Flash Light. Bright coral orange shimmer. 04 Photo Flash. Magenta red shimmer. 05 Hot Flash. 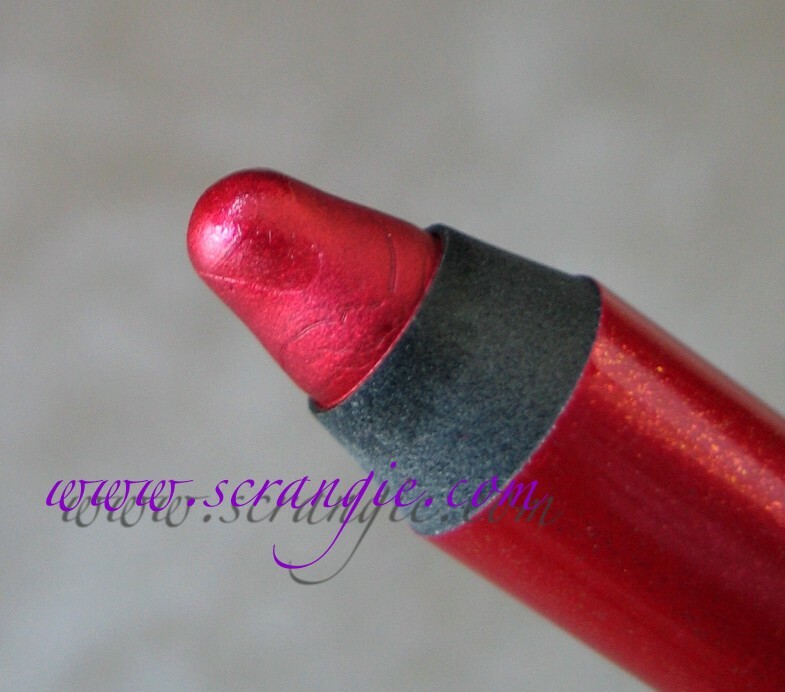 Orangey red shimmer with gold duochrome. 06 Flashy. 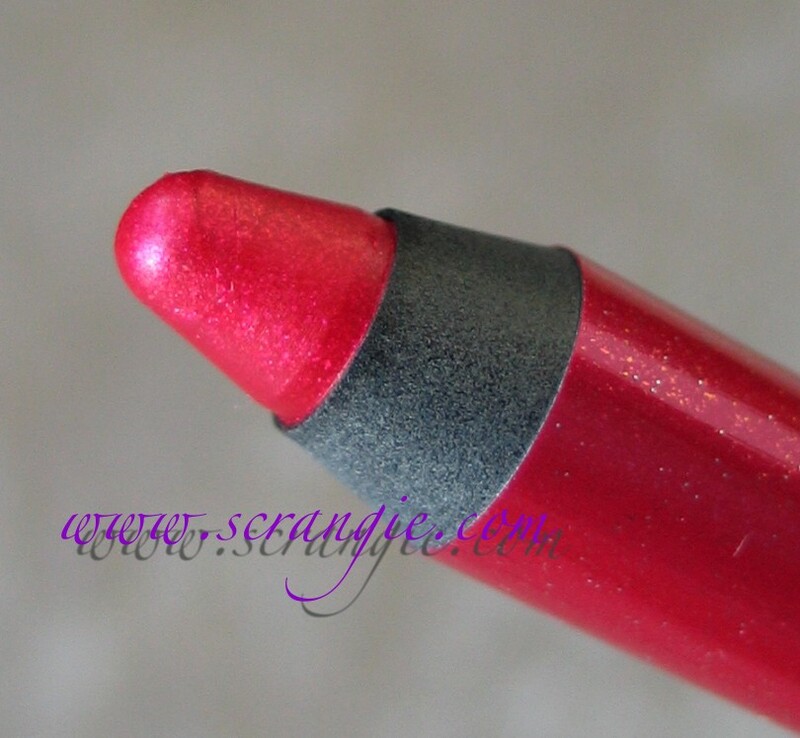 Hot fuchsia shimmer. 07 In A Flash. Bright purple shimmer with blue flash. 08 Star Flash. Pastel baby pink shimmer with blue flash. Left to right: 01 Lip Flash, 02 News Flash, 03 Flash Light, 04 Photo Flash, 05 Hot Flash, 06 Flashy, 07 In A Flash, 08 Star Flash. 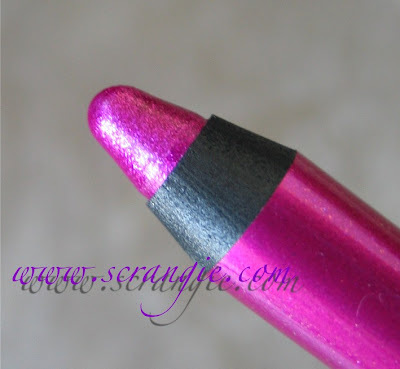 The texture and finish of these is like a mix between MAC Digi Dazzle lipsticks and MAC Dare To Wear Lipglass- it has tons of bright color but it's intensified with this large particle, semi-flaky metallic shimmer. Most of the shades have some duochrome to them. Instead of being matte or glossy, it's in between. There's a bit of shine but the texture is more like a lipstick. 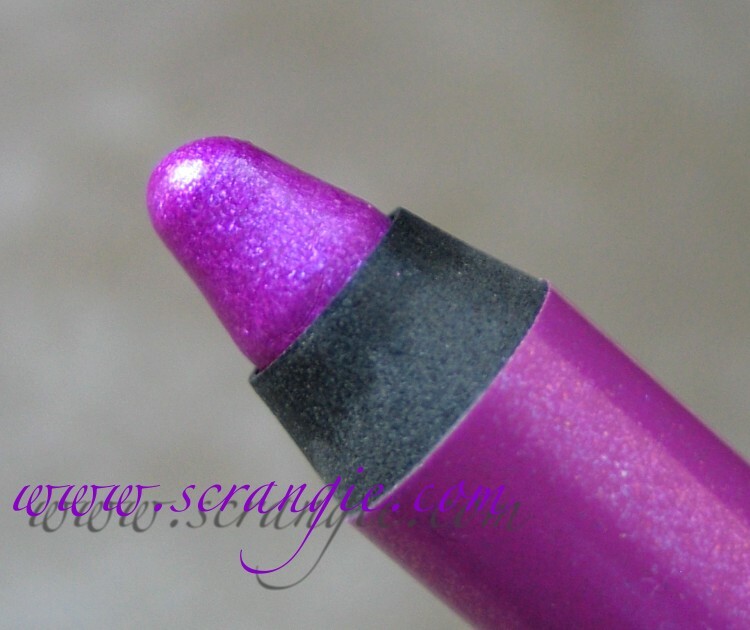 The shine wears off after a while leaving you with a matte shimmer finish, which I like, or you can add gloss to make them even shinier and more sparkly. They're actually really nice layered with the Milani 3D Glitzy glosses, and the colors in both lines even coincide with each other. They're quite long wearing due to the lipstick-like texture of these. The fact that they're in pencil form gives you a more precise application without having to use lipliner. They have no detectable flavor or scent. I absolutely adore the shade range. There's not a bad color in the batch. They're all bright and colorful and most importantly, interesting. 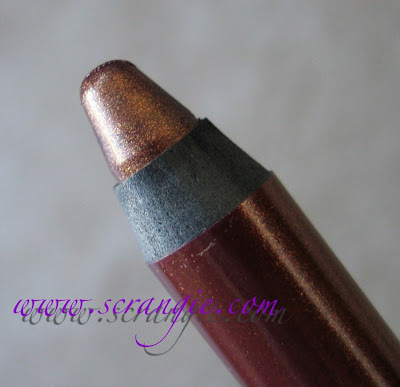 Even the brownish-bronze shade, which is a color I'd rarely choose for lips, is beautiful- the duochrome on it makes it very wearable and not at all boring. The only downsides I can find with this product are fairly minor. First, the packaging. Since it's in pencil form, you will have to sharpen it. Keep that in mind when carrying them in your purse. The caps also tend to come loose and this could be a problem, so also be aware of that. 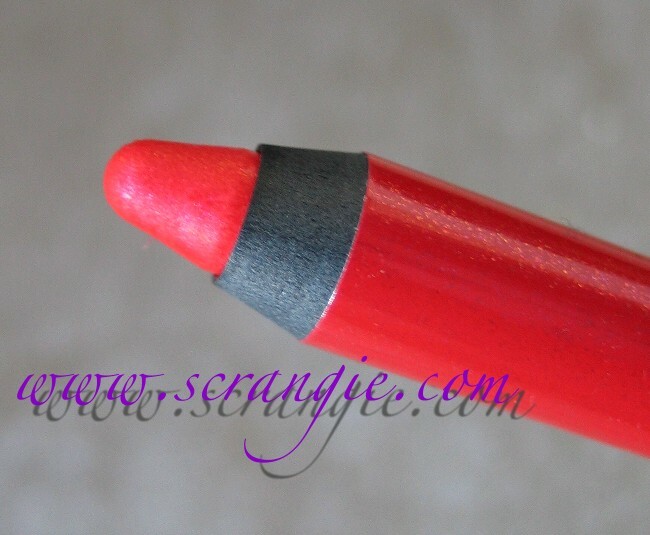 Secondly, the formula is very lipstick-like and long wearing so it can be a drying after a while. I'd recommend applying balm in between applications. Other than that, these things are awesome. I really, really like these, especially the vibrant purple In A Flash shade. I only wish they were scented! I've been out of the drugstore makeup loop for a while, but I'm really impressed with all these great quality and fun colored items cropping up lately. Brands like Milani and Wet n Wild have really changed my opinion of drugstore makeup and now I find myself being really excited to check the cosmetics aisle every time I go shopping. How freaking cool. 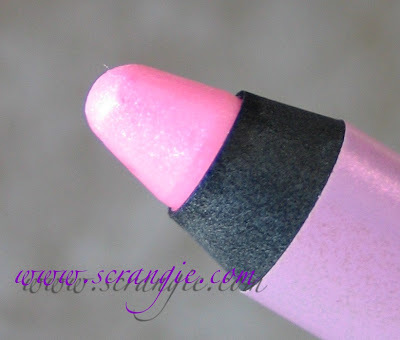 I like the idea of a lipstick and gloss in a pencil. The shades are nice too. I have four of these and I love them all. I work in a busy coffee shop, and I wore the Hot Flash every day during the holidays. I got an insane amount of compliments on it from men and women alike. I just can't rave about these enough. The wear is fantastic, the application is easy, and they didn't dry out my lips. I want them all. did you try star flash yet? In A Flash looks incredible! Wish we had Milani in the UK. I have to see these in person. Looks great! It's unrelated to this post but I would like to request a swatch of RBL Starfish-Patrick? those are so pretty. i wonder if i could wear them without breaking out. You know that your feeding the habit of a lipstick addict? I've got to have these. Like my polish, I'll never run out of lipstick and glosses in every form. Just can't resist them. They are fabulous shades. The shimmer and duochromes are fantastic. Me want! This is unrelated but I just found your pictures on a Swedish auction site and wondered if you where aware of this? Or maybe you think it is okay? This seller has a few of yours and some from other bloggers. Lip flash is so pretty! I have been looking for these in every drugstore in my town for weeks and non of the drugstores carry them! Does anyone know of any etailers or online sites that sell Milani products? Please help! I NEED these in my life! Splattergirl, I've worn it twice but I think my lips are too dark for it =/ In some lights it looks nice, but in others it looks too pale on me! Foxycontin (lol I love your username! ), you can actually order them directly from Milanicosmetics.com but I think cherryculture.com sells them too!